Docomomo Slovenia hostED the 15th International Docomomo conference in Cankarjev dom – Cultural and Congress Centre Ljubljana in August 2018. We talked to Docomomo Slovenia Coordinator Nataša Koselj about Docomomo, about Cankarjev dom, and about architect behind Cankarjev dom, Edvard Ravnikar and his structuralism. Docomomo, the international committee for documentation and conservation of buildings, sites and neighborhoods of the Modern movement, every two years organizes an international conference that brings together members and friends from its 72 national Working Parites, as an opportunity for in-depth exploration of an important theme or aspect of the Modern Movement. For three decades, Docomomo has been putting effort to preserve and adapt the technical, social and aesthetic goals of the Modern Movement – values which have always been intrinsically intertwined with change. Its 15th Conference, held in Ljubljana’s Cankarjev dom – Cultural and Congress Centre (CD) in late August 2018 was titled Metamorphosis – The Continuity of Change and it addressed the history of Modern Movement transformations. We talked to Nataša Koselj, Docomomo Slovenia coordinator, about the conference and about Cankarjev dom – Cultural and Congress Centre. Q: How come Docomomo decided to hold its Conference in Cankarjev dom? The first suggestion to organize this conference came from Cankarjev dom in 2012. More serious discussions started then in 2014. In 2016, I prepared the conference content and presented it at the 14th International Docomomo Conference in Lisbon. Since the very beginning, Jože Plečnik, Edvard Ravnikar, Alexander Tzonis, and Liane Lefaivre had been included in my conference programme. I must admit, it was quite strange seeing my presentation comparing to presentations from other countries which usually bring along dozens of delegates to present their conference proposals. I, on the other hand, had no support except from Cankarjev dom. However, it seems that the moment was right, and everybody wanted to come see Plečnik’s work, thus, my proposal for holding Docomomo in Cankarjev dom was accepted. Q: This year’s conference was a special conference marking the 30th anniversary of Docomomo’s establishment, as well as celebrating the 15th conference. 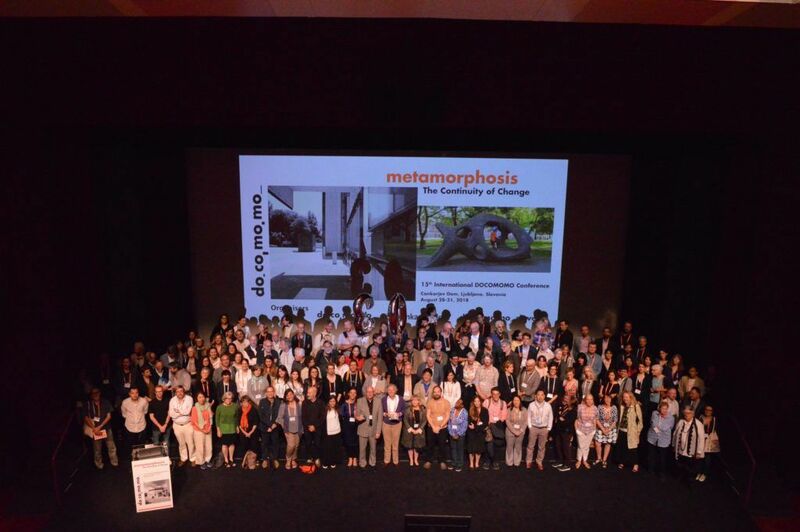 The title of the conference was Metamorphosis – The continuity of change. How does this title relate to Cankarjev dom? The title Metamorphosis relates to Kafka’s novel Metamorphosis; the novel has been my inspiration since 2000, when during my PhD studies I started studying the complexity of problems of the Modern Movement architectural renovations. Kafka was also my starting point of the conference presentation in Lisbon. There are lots of absurdities and paradoxes in the discussion of the Modern Movement architecture conservation that Kafka so brilliantly develops in his Metamorphosis. Coincidentally, this year, Cankarjev dom celebrates a centenary of Ivan Cankar’s death and there is an actual exhibition titled: ‘Ivan Cankar and Europe. Between Shakespeare and Kafka.’ Inside the Docomomo debate, it is all about the Modernity that we must preserve or re-invent by renovating and re-using buildings. Q: How does Ravnikar’s architecture echoe in the international world? At the moment, Jože Plečnik has been very interesting to study again. We are witnessing a postmodernism’s revival in architecture, and Plečnik is somehow regarded as a father of postmodern architecture. Thus, Docomomo community knew Plečnik and they wanted to come to Ljubljana to see his works. But once here, they were also stunned by Ravnikar’s Republic Square, Cankarjev dom and Ferantov Garden. These Ravnikar’s works represent the peak of Slovenian structuralism developed from Plečnik. Ravnikar’s works have been also presented by a parallel photographic exhibition ‘The World In-Between’, by photographer Janez Kališnik, showing The Republic Square in the time of construction. Q: The conference had more than 100 lectures distributed into 18 parallel sets. How many attendees were there? Would you, please, highlight some of the most important parts of the conference? There were approximately 300 participants from all over the world from Palestine to Finland, from USA to Iran. The first two keynote lectures were dedicated to Aldo van Eyck, presented by Dutch Hubert-Jan Henket, and Canadian Liane Lefaivre; the second day was about Plečnik and his influence in this region, presented by Slovene Damjan Prelovšek and Czech Vladimir Šlapeta. The third day keynote lectures were dedicated to the community and social housing by the lectures of Swede Claes Caldenby and Greek Alexander Tzonis. The last day’s keynote lecture was by Slovene Špela Videčnik, from OFIS architects, who represented the local identity of OFIS’ recent projects. The papers inside the 18 sessions were dealing with topics from philosophy and politics in architecture to the technical questions about the energy efficiency of the modern neighborhoods. There were many highlights of exceptional quality of lectures and papers presented, but as we were celebrating 30 years of Docomomo, I shall put the roundtable ‘30 years of Docomomo’ as this conference’s highlight. Q: How did the international guests find the venue? What were their comments? In 2018, we celebrate another centenary: a centenary of birth of Aldo van Eyck, the father of Dutch structuralism and a member of Team X – a group of architects that criticized the dogmas of pre-war modernism and wanted to bring social structure and historical memory back into the architectural discourse. Therefore, Cankarjev dom turned out to be an ideal venue to celebrate the 30 years of Docomomo. Docomomo was established in the Netherlands in 1988 by the architects Hubert-Jan Henket and Wessel de Jonge. When Prof. Hubert-Jan Henket visited Cankarjev dom for the first time in 2016, he asked why Edvard Ravnikar was not a member of Team X. This tells us a lot about how Henket found the venue. Q: Is there anything else you would like to add in regard to Cankarjev dom as a venue? I would have never dare to organize Docomomo conference anywhere else but in Cankarjev dom. It turned out to be an ideal venue to celebrate 30 years of Docomomo and at the best possible timing. Actually, this was the first international scientific conference of this size and this character in Slovenia. We have never had anything similar organized for architects and other specialists dealing with the questions of modern cities. Coincidentally, again, Docomoma came in a moment parallel to the MoMA NEW YORK’S exhibition dedicated to the post-war architecture in the former Yugoslavia. I hope that Cankarjev dom will keep the spirit of Modernity alive through its future programme and actions. It truly represents the heart of the city and the heart of the nation, and this is what Ravnikar’s main intention was.